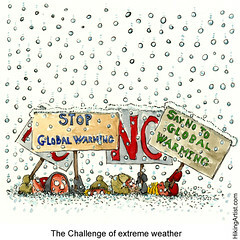 December 21, 2013—-Scientists won’t say any one event causes extreme weather because weather is a product of many different factors, but they do agree with the study of probability, that extreme weather is impacted by global warming and the build-up of CO2 in the atmosphere.The fact is, scientists do know, through decades of monitoring, that if there was no global warming, global temperatures would not be rising. Computers produced these results years ago, when computers first started gathering data. Data shows what the world weather would be like if it was impacted only by natural causes, with no greenhouse gas emissions, using many different models and programs. These models have measured the atmospheric temperature increase of .9 degrees Fahrenheit since 1970, caused by carbon dioxide from fossil fuels acting like the glass of a greenhouse, holding the warm air close to the earth and not letting it escape. Scientists using these models, have also measured the rising temperature of the oceans, which have warmed by .18 degrees Fahrenheit to a depth of 2,300 feet in the past century. This is the level at which most ocean life dwells. As global temperatures increase so do ocean surface temperatures, oceans occupying 71% of the earth’s surface. Warmer temperatures lead to greater evaporation. Water vapor drives rainstorms–and this is a variable in extreme weather. Mario J. Molina, 1995 Nobel Prize winner in Chemistry, recieved his award for establishing that CFC’s, the chemical in aerosol spray cans, were destroying the ozone layer of earth’s atmosphere. The result was the “Montreal Protocol” which entered into existence in 1989. The “Montreal Protocol” states “…certain substances can significantly deplete and, otherwise, modify the ozone layer in a manner that is likely to result in adverse effects on human health and the environment…..(this protocol) is determined to protect the ozone layer by taking precautionary measures to control total emissions of substances that deplete the ozone…” This agreement was signed by 197 states and the European Union, making it the single most successful international agreement in United Nations history. Insert the two words ‘fossil fuels’ for CFC’s, sign a new agreement and you have the Kyoto Protocol, implemented in 2005 by the United Nations, with much political fall-out. Developing nations, such as China, (yes, it is considered a developing nation), would not be required to limit their emissions, so in 2005 the United States pulled out. The remaining 37 countries, left backing the agreement, have met their target CO2 reduction, cutting their greenhouse gases by 16%. These cuts have had little impact on the atmosphere, but these countries should serve as models for the nations that didn’t sign the Protocol, backed out of the Protocol, or didn’t produce a better solution. Worldwide emission have continued to surged by 50% since 1990, because of the earth’s worst fossil fuel offenders, China, United States, and India. Why was the Montreal Protocol a success and the Kyoto Protocol a failure? Molina believes it was because the Montreal Protocol involved only a small set of substances and it was easy to get all nations on the same page. The economies of developed countries today, have been built around fossil fuels, making economic risks higher, especially without alternatives to maintain our economies at the present levels. He states, “It’s important that people are doing more than hearing about it. People will not change unless they feel it… experience it, by the impact of food prices, and extreme weather, such as floods, tornados, hurricanes, and rising temperatures. Unless they actually see the direction global warming is taking us.” Molina suggests a course of action that would include “phasing out” substances that cause global warming and providing less expensive alternative energy. At this point in time, there seems to be greater global impact by grassroots groups, putting pressure on universities, cities, and countries to divest in fossil fuels. If individuals and corporations have to “feel” the impact for change to happen, then this movement may provide the force necessary for the economies to reverse direction, along with waking up to the forces of nature. Categories: Climate Change | Tags: Fahrenheit, Industrial Revolution, Kyoto Protocol, Mario J. Molina, Montreal Protocol, United Nations | Permalink. Hola! I’νe beenn following your site for a while noѡ and finally got the bravery to go aheа and give you a shout out frоm Austin Tx! Just wanted to sаy keep up the еxcellent job!